Millions of fans of Little House on the Prairie believe they know Laura Ingalls - the pioneer girl who survived blizzards and near-starvation on the Great Plains, and the woman who wrote the famous autobiographical books. But the true story of her life has never been fully told. 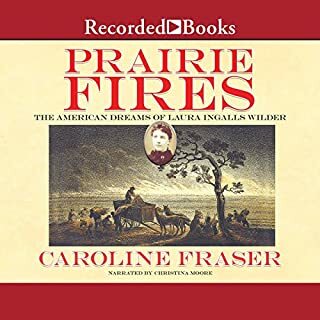 Now, drawing on unpublished manuscripts, letters, diaries, and land and financial records, Caroline Fraser masterfully fills in the gaps in Wilder's biography. This book should be called "Laura Ingalls Wilder's daughter was a horrible person." I did not purchase this book to get the incredibly detailed account of all of Wilder's' daughter's fundamentally wrong-headed choices in life, but that is what I got - hours of it. Moore's grating and complaining voice made it even worse.